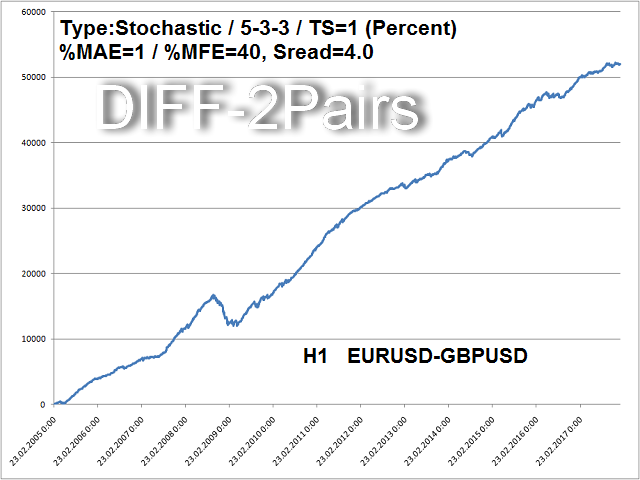 DIFF-2Pairs detects divergences of correlated pairs considering lots balancing (+ built-in strategy tester). the system can measure performance. statistical analysis to determine the optimal SL and TP. exporting data to a CSV file. 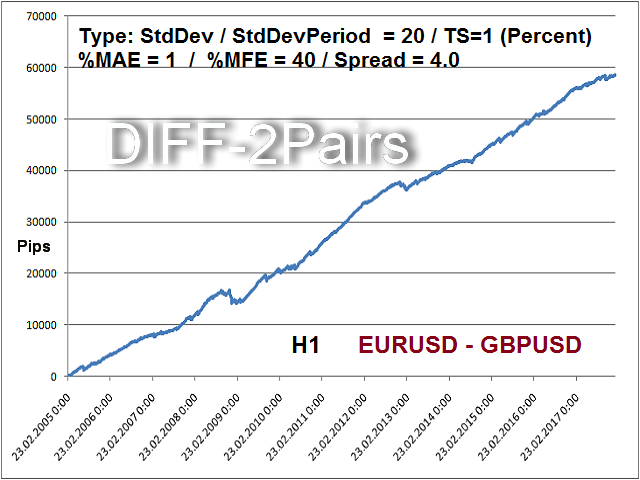 The standard deviation is the measurement of the standard deviation (StdDev). 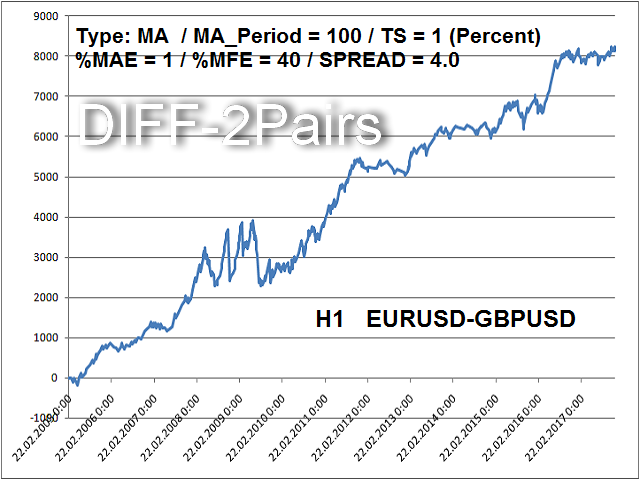 MA - measuring the difference in deviation (Moving Average). 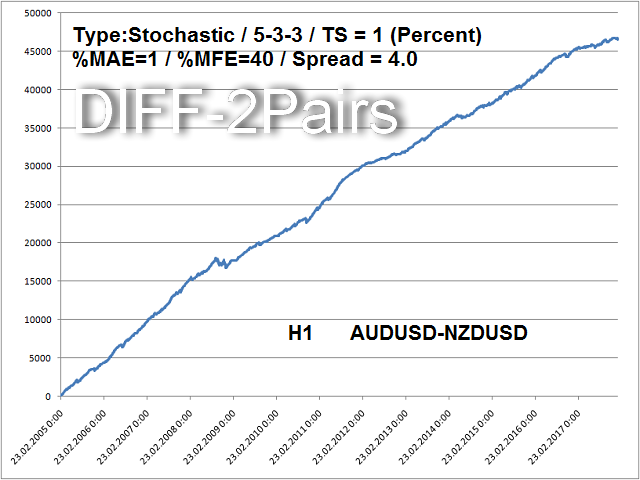 Stochastic – stochastic value of the deviation difference - Stochastic. The price deviation of correlated pairs (difference) is displayed as a curve. 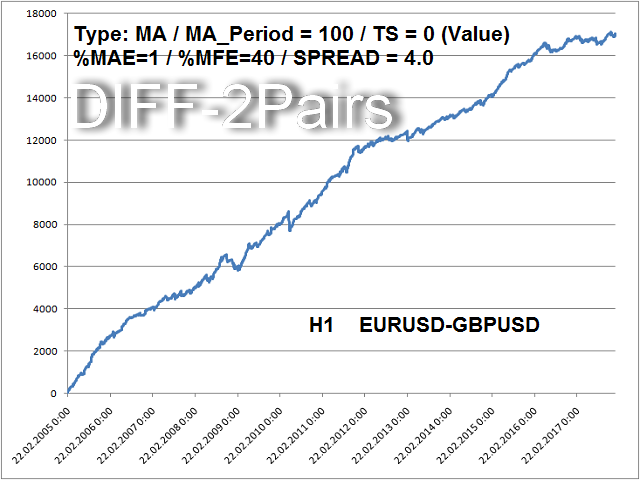 Once the price divergence goes beyond, you open a position and close it after returning to the average value (ideal value). 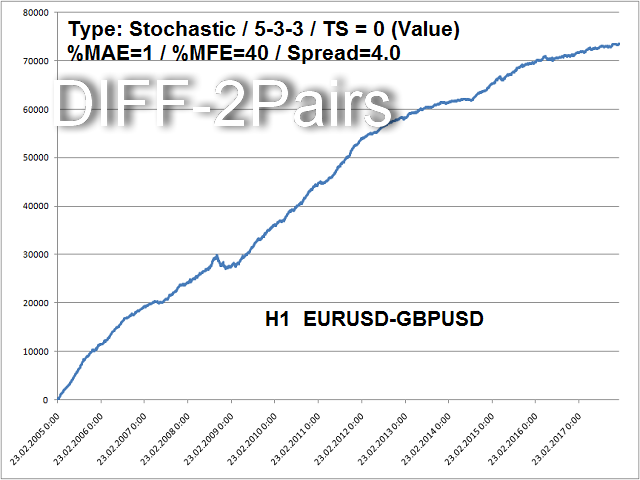 MFE analysis (Maximum Favorable Excursion) - helps us determine the optimal Take Profit (TP). This is the maximum profit. MAE analysis (Maximum Adverse Excursion) - helps us determine the optimal Stop Loss (SL). This is the maximum loss. At a discrepancy there are 3 inputs (3 × 2 pos.). After login, the calculation of MAE and MFE. Using this method allows you to increase profits. The system is more advantageous than without SL and TP, and is more reliable. Various methods of modeling on history can be exported to an Excel file. 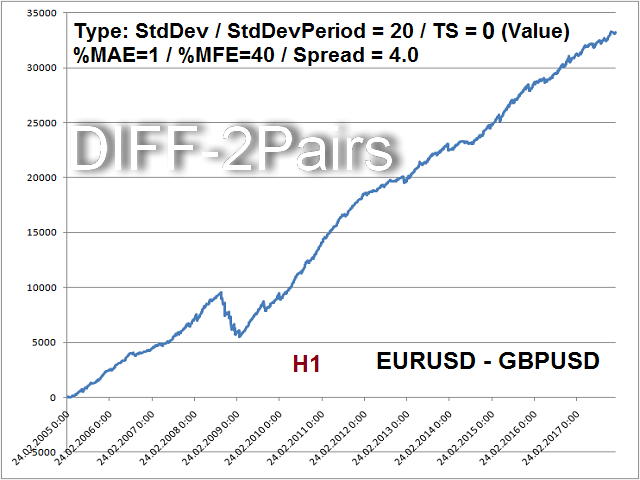 This is a kind of strategy tester for pair trading (trade results can be analyzed using Excel tools). In the indicator, two characters are entered and it should be on the chart of the 1st symbol. The signals are given by the indicator in the form of an alert, and the chart shows, in which direction it is necessary to open the traded symbols of the correlated pairs and with what volume (Lot). 1. 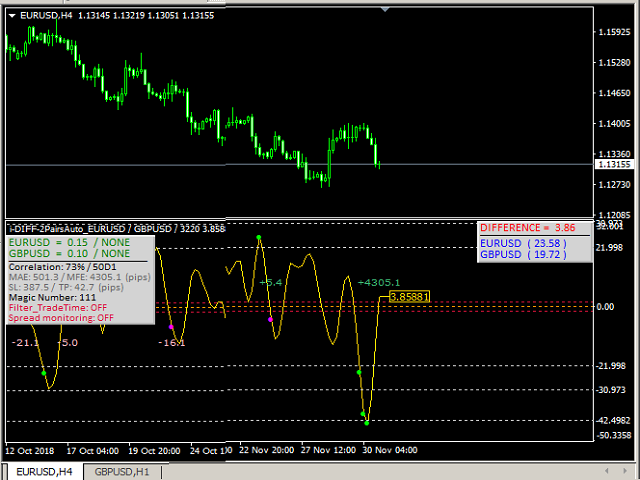 Indicator indicates the specific direction of trade, depending on the discrepancy. 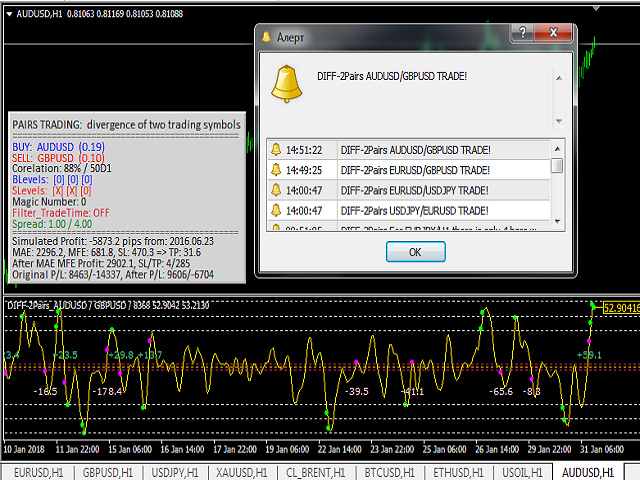 The information is indicated when the signal is received for trading. - UseDoubleSignalInChart	- Output additional panel with information on the graph (bottom right corner). - UseFind_SymbolInMarket – проверка символа на наличие в обзоре рынка. 4. Control of the presence of a symbol in the market review. 5. Control of symbols for trade approval. 6. Control of the pairs of open positions.